I’m finally back from Chinatowns in London and Prato, Italy, and ready to catch up on some blogging. Since it’s Christmas season, the time of year for copious amounts of decadent food, and since it’s lunchtime as I write this, let’s start with the Chinese food that I found in London. Now, I definitely had delicious Chinese meals in London (thanks to Dr. Cheng and the Association of Traditional Chinese Medicine), but that’s not the food I’m talking about here. I’m talking about popular Chinese-British creations that one can usually find at takeaways, like crispy seaweed and aromatic duck. Two Londoners, Gerald and Winky (who writes a fun blog at Winkypedia), introduced me to these local specialties recently in a restaurant on Gerrard Street. This popular appetizer is a deep-fried concoction that is simultaneously sweet, salty, fried, and crunchy. Those little white specks in the photo? Sugar, lots and lots of sugar. 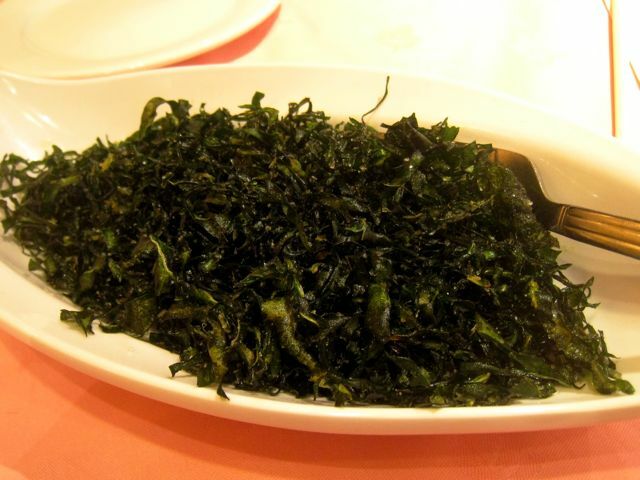 The dark green color comes from food coloring, since crispy seaweed isn’t made from seaweed at all, but from cabbage. I am embarrassed to admit that my taste buds have placed crispy seaweed rather high in my pantheon of irresistible junk food, just below cheesy poofs. Amazing as a late night snack. Why hasn’t anybody found a way to package this for the supermarket shelves? 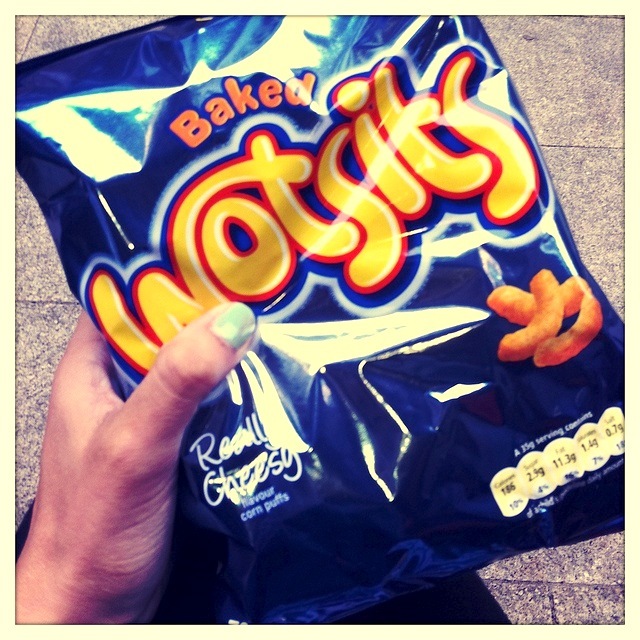 100% "Really Cheesy". Photo by Flickr member Yaili. This one is just incomprehensible. Take shrimp and chicken bits, slap them on toast, batter and deep fry the whole thing. 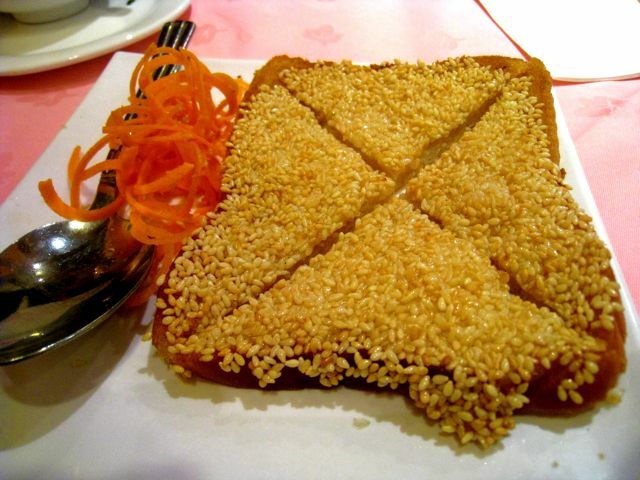 For a final touch, pour sesame seeds all over the toast. Slice neatly into four wedges and serve. I imagine this might be a hit in the South or anywhere deep fried Twinkies are on the menu. Deep fried, shredded. Smothered in a sticky orange sauce. Sensing a pattern here? The English version of Peking Duck takes the iconic northern Chinese dish one step farther by — surprise! — deep frying the duck. The bird is brought to your table, at which point a waiter will proceed to shred the somewhat overcooked meat into smaller chunks. 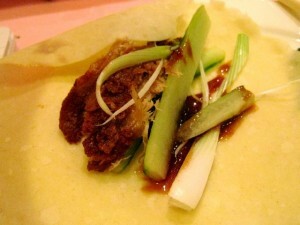 Wrap one up with scallions and hoisin sauce in a little steamed pancake. Not too shabby! Can someone please explain the preponderance of deep frying in British-Chinese food? The truth is, the last refuge of would be cooks is… deep frying. Deep frying anything (pickles, twinkies, etc.) can only make it taste better and more interesting… And deep fried foods are useful to attract customers, since deep frying is not practical to do at home. London has lots of good/great Chinese restaurants. 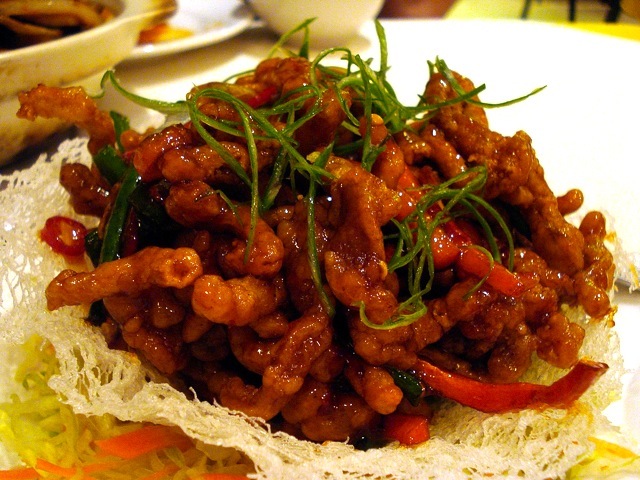 After all, the best cooking in the world is Cantonese–especially Hong Kong–cooking (remember the saying? : you should be born in SooChou (beautiful people), eat in QuangChou, and die in FuJou (best pine caskets)), Because London has had a connection with Hong Kong for over 200 years, London has a great many really good Chinese restaurants, many staffed by great Hong Kong chefs. 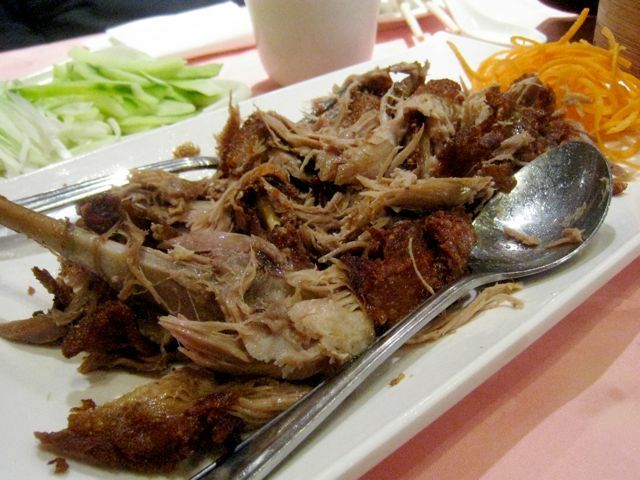 But in London, as in all places where Chinese go, invariably, there are Chinese restaurants–especially small takeaways–that are owned and staffed by Chinese who never pretend to be good cooks (because, what do the Old Foreigners know anyway, right?). These establishments just want to make a living selling cheap food that is a somewhat adventurous to the foreign palate and.tastes OK. In London, evidently, many of these places exist, and some of them sell the deep fried foods you depict. The foods you show definitely look Artery Clogging, but OK to eat once in a long while (with lots of white rice or noodles and lots of vegetables). Are they Chinese food? Of course, they are: Chinese people cooked the food with Chinese style techniques and sauces. what fun! it’s also a riot that a chinese medicine practitioner took you on this crazy tour. the stuff you ate is so unhealthy! thanks for the fun read.